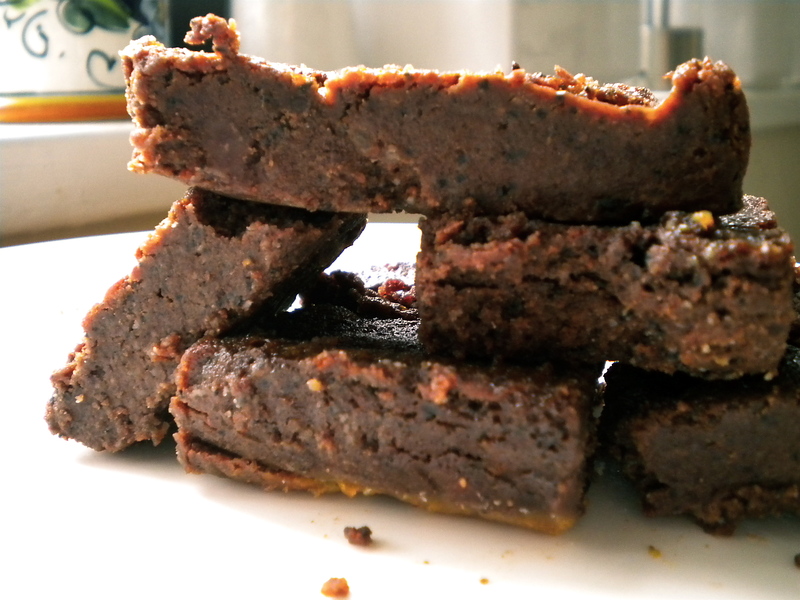 Black Bean Brownies – Voila! You have to bake it to believe it. I only got James to eat them without any preconceived notions by telling him beforehand that there’s a secret ingredient which I would not divulge until after he ate one. His guesses for this secret ingredient included: arugula, leeks and brussles sprouts. The honest truth about these brownies is that they tasted a little grainy. The texture just wasn’t quite right. It could be because I added too much ground coffee and/or didn’t process the beans for at least two minutes. I’m curious to try them again (sorry, James) and see what kind of improvements I can make. If y’all make them and have some tips, let me know! Preheat the oven to 325. Line an 9×13 inch glass baking dish or 11×18 inch jelly roll pan with parchment paper and lightly oil or butter. 1. Melt the chocolate and butter in a glass bowl in the microwave for 1 1/2 to 2 minutes on high. Stir with a spoon to melt the chocolate completely. 2. Place the beans, 1/2 cup of the walnuts, the vanilla extract, and a couple of spoonfuls of the melted chocolate mixture into the bowl of a food processor. Blend about 2 minutes, or until smooth. The batter should be thick and the beans smooth. Set aside. 3. In a large bowl, mix together the remaining 1/2 cup walnuts, remaining melted chocolate mixture, coffee substitute, and salt. Mix well and set aside. 4. In a separate bowl, with an electric mixer beat the eggs until light and creamy, about 1 minute. Add the honey and beat well. Set aside. 5. Add the bean/chocolate mixture to the coffee/chocolate mixture. Stir until blended well. 6. Add the egg mixture, reserving about 1/2 cup. Mix well. Pour the batter into the prepared pan. Using an electric mixer, beat the remaining 1/2 cup egg mixture until light and fluffy. Drizzle over the brownie batter. 7. Use a wooden toothpick to pull the egg mixture through the batter, creating a marbled effect. 8. Bake for 30 to 40 minutes, until the brownies are set. Let cool in the pan completely before cutting into squares. Store in refrigerator. Our black bean brownies were also flat and grainy. I think it’s the nature of the recipe. Super yummy though. I usually add an egg. That gives it some lift and helps with the texture issue. Also, really process the heck out of the black beans. You could try leaving out the coffee too. I don’t own instant coffee so I never add it. Hope it works for you! Pingback: Cocoa Brownies « Voila!